9CB7835C-2-FC-68 was the location of MONEY, with two pointers, their offsets being FC and 68. When I try to find a third pointer, I get what you see in the Extra Info window, showing my pointer is probably 00000014. The two below that are pointers for FAITH, both with two offsets (64 & 28 or 104 & 68 ). Trying to find a third pointer for either of them leads to a similar Extra Info window, where the pointer is 00000014. I know those aren't correct, but not sure where to go from there. As an alternative option, I've found I can use Code Injection to Enable/Disable the Increase/Decrease of Money/Faith, but haven't read enough to know how to code it in a way where I can click enable and have the values set to a figure, whilst also doing that. If someone could point me to a better tutorial on code injection, that'd be appreciated. As a final option, and not something I've ever looked at before, this game is coded using Unity (FMod) and I've looked at the Mono Dissector. A few quick videos showed I should be able to find functions for money/faith under Assembly-CSharp. As I couldn't actually find anything with Functions or Fields under Assembly-CSharp, I also tried checking a few other branches, but nothing. 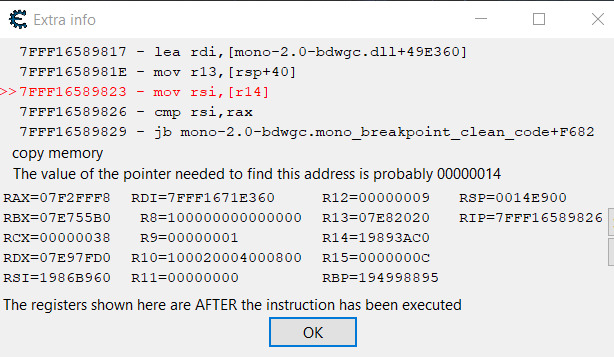 Not sure if this would be a viable way for me to hack the game, but as I was new to the Mono Dissector, figured I'd look it over and any help/tutorials on using that would work as well. EDIT: This was supposed to be posted under General Gamehacking, not sure why it changed the forum at the time of posting.